Jaipur : Senior Congress leader Ashok Gehlot was sworn in as Chief Minister of Rajasthan for a third time while Sachin Pilot took oath as Deputy Chief Minister at the Albert Hall here on Monday. 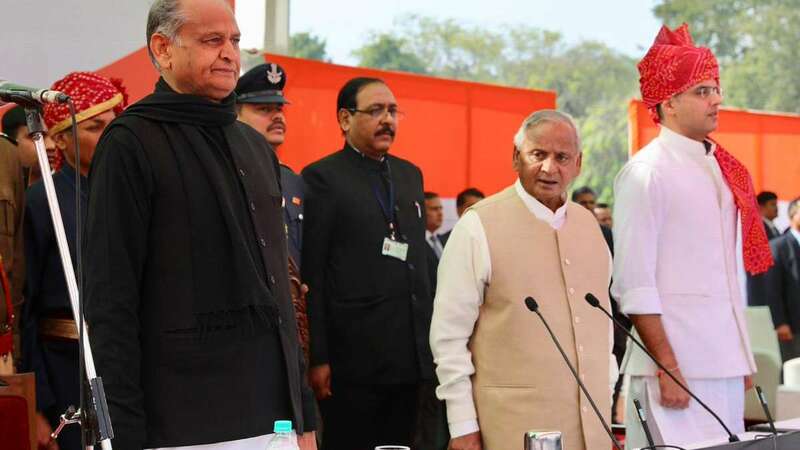 Governor Kalyan Singh administered the oath of office and secrecy to them in the presence of Congress President Rahul Gandhi and former Prime Minister Manmohan Singh. Among those who were at the venue were NCP chief Sharad Pawar, Chief Ministers N. Chandrababu Naidu (Andhra Pradesh), H.D. Kumaraswamy (Karnataka) and V. Narayanasamy (Puducherry), former Jammu and Kashmir Chief Minister Farooq Abdullah, RJD leader Tejashwi Yadav, DMK leader M.K. Stalin, JMM leader Hemant Soren and Jharkhand Vikas Morcha chief Babulal Marandi. Former Rajasthan Chief Minister and BJP leader Vasundhara Raje also attended the event along with Congress leaders Mallikarjun Kharge, Jyotiraditya Scindia, Kumari Selja, Jitin Prasad and Navjot Singh Sidhu. The Congress rode to power in Rajasthan after five years, defeating the Bharatiya Janata Party in Assembly elections.